LANGLEY, B.C. 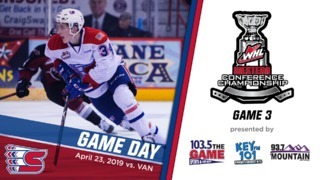 — Despite Adam Beckman’s two-goal performance, the Vancouver Giants rallied for a 5-4 shootout victory over the Spokane Chiefs on Sunday night in Langley, B.C. 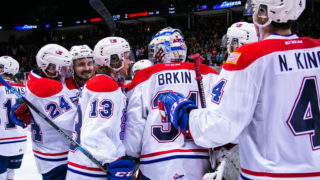 Despite the loss, Spokane moved into first place in the U.S. Division by one point. The Chiefs compiled five of a possible six points in their three games in three nights in three different cities over the weekend. Spokane jumped out on top just over 3.5 minutes into the game when Bobby Russell scored a goal in his second-straight game. 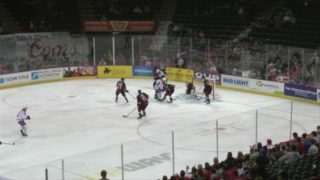 Michael King and Erik Atchison picked up their first points as Chiefs with assists on Russell’s goal. Beckman then made it 2-0 midway through the period on a shot between the circles from Riley Woods and Ty Smith. Vancouver scored just over a couple minutes later to cut the margin to 2-1 after one. Beckman’s second of the night, on the power play from Woods and Carter Chorney midway through the second period put the Chiefs ahead 3-1. Vancouver would score two goals just over three minutes apart to come back and tie the game at 3-3. 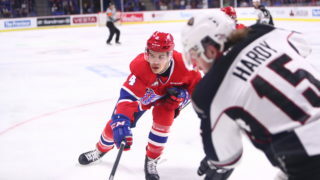 Spokane would re-gain the lead when Jack Finley scored his first WHL goal with 38 seconds left in the period to give the Chiefs a 4-3 advantage after two. The lead held up until the final minute of regulation as Vancouver scored with the extra skater on to tie the game at four apiece. Neither team was able to score in the five minute overtime as the two teams went to a shootout for the first time this season. After a scoreless round one, Vancouver scored in round two to go up 1-0. The Chiefs’ Eli Zummack forced sudden death rounds with a score in round 3 to tie it 1-1 in the shootout. The Giants’ Brayden Watts, who had tied the game in regulation, scored in round 4 to put the Giants ahead 2-1. 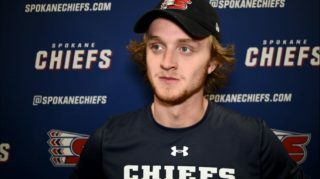 Spokane’s Carter Chorney was denied in the same round, and the Chiefs’ modest two-game win streak came to an end. 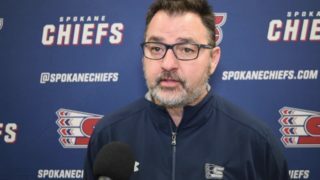 Riley Woods and Ty Smith each had two assists in the loss, as the Chiefs will return home to play a two game homestand against the Central Division’s Medicine Hat Tigers and Edmonton Oil Kings on Friday and Saturday at the Spokane Arena. Mike Boyle will have the call on 1510 KGA starting with the pre-game shows at 6:30 p.m. and the puck drops at 7:05.